Everyone loves a good spontaneous combustion story, which is probably why the media jumped all over a forum posting last month by an Irish Samsung Galaxy S III user who claimed their phone had burst into flames in their car. "So I [sic] driving along today with my Galaxy S3 in my car mount when suddenly a white flame, sparks and a bang came out of the phone," Boards.ie forum user "dillo2k10" wrote on June 20. "I pulled in to look at my phone, [it] burned from the inside out. Burned through the plastic and melted [the] case to my phone." While the tale was a good one, it was also just a tale. Following the publishing of a report Friday by Fire Investigations, a firm hired by Samsung to investigate the incident, the user came clean. "I would like to retract my original statement," dillo2k10 wrote. "The damage to the phone was caused by another person, although they were attempting to recover the phone from water this later caused the damage shown on the phone. It occurred due to a large amount of external energy and there was no fault with the phone. This was not a deliberate act but a stupid mistake." The "large amount of external energy" is believed to have come from a microwave. In his report for Fire Investigations, investigator Peter Mansi noted that the physical damage to the phone's internal components did not appear to have been created from energy within the handset but rather from an external source. He added that the phone's antenna is a passive component unconnected to a power source. "It is, however," he added, "a suitable conductor for microwave energy and our tests clearly demonstrated this." He also suggested that Samsung question the phone's owner as to why the moisture detection patch had been removed from the device. Following the youth's report of the flaming Galaxy S III, a Samsung customer service rep visited the user and replaced the damaged unit and promised him some free stuff. It's unknown whether Samsung will repossess the replacement phone. 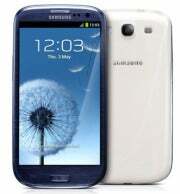 The Samsung Galaxy S III was released in June and has received rave reviews. Samsung expects to ship 10 million of the units worldwide by the end of this month.